For some good old fashioned ale brewing fun, Minecraft players might want to try this mod. GrowthCraft Hops gives players a new crop to grow and new crafting recipes built specifically around it. This mod is meant to simulate real life brewing, yet in a simple way in keeping with the spirit of Minecraft. Hops is a new crop that adds some diversity to farming in Minecraft. Players can obtain the seeds – also known as hops rhizomes – from the tall grass. Destroying tall grass yields hops rhizomes at one quarter the rarity of wheat seeds. Like other seeds, the rhizomes can be planted on tilled grass blocks. A fence four blocks tall must be placed atop the hop when planted, as the hop vine grows four blocks upward along the fence post. Nothing should be planted immediately adjacent to the rhizome, as it needs room to produce hops. Once fully grown, the vine produces hops on each side. Destroying the plant drops one seed and one hop. Shearing the plant drops additional seeds. 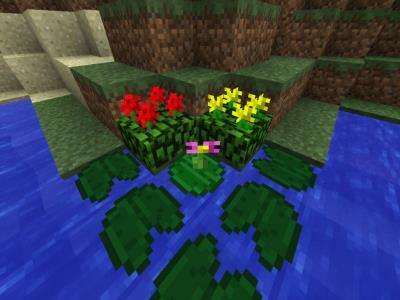 As with other plants in Minecraft, players can use bone meal to accelerate growth. Producing ale requires a few new items, which are part of GrowthCraft Hops Mod for Minecraft. The new crafting recipes included are wheat bushels, hop bushels, ale, and a bucket of ale. With these recipes, along with a cauldron and heat source, players can craft a new food source. Ale restores three food points, but beware: it also has a 50% chance of inducing nausea. Ingesting it also causes a haste effect. The duration of the effect, which results in faster arm swings and block breaking, depends on the potency of the ale. Getting tipsy in Minecraft is now both fun and productive!